The other day I wrote about my decision to go for a year without drinking any alcohol, and my start date is now just a couple days away - as of this Monday, August 19th I will be alcohol free! I've told a lot of people about my decision to stop, and it's been met with mixed attitudes. Some think it's an awesome idea, an awesome experiment. They're curious to see how it goes and to follow along! Some think it's crazy and that I'll never be able to do it - or they just question why would I ever choose to do it? Some have a very small reaction - I don't drink a lot now, so what's the big deal? They're right that I don't drink often anymore - I'm more likely to order water with dinner and I rarely make a drink while I'm sitting at the house watching a movie. I'm not doing this because I believe I drink too much or too often, because I know that's not true. I'm doing this because I truly want to test myself and push myself to do something that a lot of people define as "crazy". I'm going to use this blog and my Facebook page, Fortitude Fitness, to share my story over the next year - as I tackle weddings, bachelorette parties, camping and the various stresses that are often met with "I need a drink". I'd love to have you follow along with me - and if you want to test yourself and join along I'd love to share it with you! 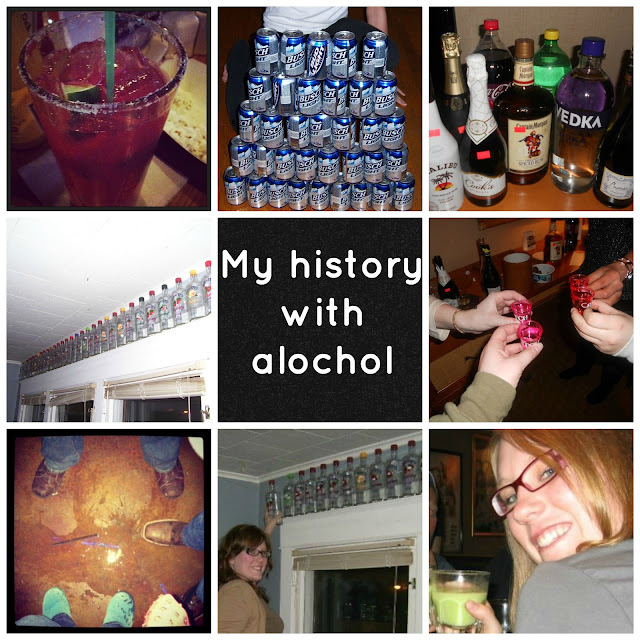 For today, I wanted to put down into writing a bit of my history with alcohol so you all know where I'm coming from. A lot of people drink before they've even graduated high school - heck, a lot of people drink before they've even hit high school! I was definitely not one of those folks - I had a great time in high school without ever getting drunk or doing a keg stand. I went to concerts, worked at a local bakery, played endless games of Cranium and just hung out - and it was awesome! When I got to college I still didn't jump right into the drinking scene - for my whole first year I didn't touch a drop. The last couple years I got introduced to vodka (Burnett's to be exact), beer and cheap wine - and I realized that I actually liked these things. I had a lot of fun but I still was never a big party-goer. 9 times out of 10 it would be me plus a couple friends and we'd be playing beer pong or watching cheesy chick movies while drinking. We probably drank too much, too often, but we had a lot of fun and avoided a lot of trouble! After college my drinking stayed similar to what it had been - though it did drop off in frequency by quite a bit. (I'm still not sure how I was able to drink 6 nights a week my senior year and still graduate on time with 3 majors - if anyone can explain this to me, I'll be forever in your debt!) If there was ever a time in my life where I actually "partied" in the normal sense of the word - actually going to parties - it was the couple of years after college. Sometimes it would be in my home area, and sometimes it would be at what is now my house with my husband, but what was then my boyfriend's house with his roommate. We would have crazy fun, but it's about this time that the dreaded hangovers started... and I was not a happy camper. Somehow in college I had managed to avoided the hangover curse and could easy wake up for class and another night of drinking. Not the case once I hit the big 2-4. Starting on Monday, though, I won't have any of these days for quite a while, though. Sure, there will be days that are harder than others but if I can lose 50 pounds and keep it off, if I can get 3 majors in 4 years of college, if I can study abroad in the south of France where I knew no one, I can have a bit of self-control and stick to my goals! I'm doing this for my health, I'm doing this for myself, and I'm doing this to prove that I can do it, even on the hard days. And really, what other reason do I need? You Rock Ashley. You have proven you can do anything you set your mind to. No good luck wishes since I know you will have no problems in meeting this goal.